a private co-ed, college prep day school for students in grades Pre-K through 12. Stay up to date with our sports teams, schedules, directions and more!. Our graduates are accepted by major colleges and universities across the nation. We try to know and understand that every activity in our school offers the child a unique and valuable learning experience. The primary objective of our school is to promote the learning process. 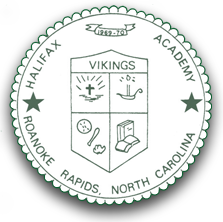 Halifax Academy is a private co-educational, college preparatory day school for students in grades Pre-K through 12, located in Roanoke Rapids, North Carolina. We offer qualified and caring teachers with small classes. The curriculum is integrated with a non-denominational Christian emphasis, a wide variety of student activities, and programs in athletics and in the arts. Our graduates are accepted by major colleges and universities across the nation. One of our goals is to see that the parents and guardians of students – like the students themselves – feel at home at Halifax Academy. We serve a public that wants not only a good educational program for their children but also expects our school to be an attractive part of the community. The primary objective of our school is to promote the learning process. The faculty and staff are dedicated to assist students in this endeavor. We try to know and understand that every activity in our school offers the child a unique and valuable learning experience. We also try to have a total, professional attitude regarding learning and meeting the needs of each student. We give our total support and encouragement to the students. We further embrace strong moral and ethical standards in all areas of the student’s school life. Stay up to date with our current news, announcements and events! We are seeking a part time Drivers Education/Physical Education teacher for the 2019-2020 school year. If interested please contact Michael Ferguson by email at mferguson@halifaxacademy.org or call (252)537-8527. Stay up to date with our sports teams, schedules, directions and more! Halifax Academy, A Christian School, Inc., admits students of any race, color, national and ethnic origin to all the rights, privileges, programs, and activities generally accorded or made available to students at the school. It does not discriminate on the basis of race, color, national and ethnic origin in administration of its educational policies, admissions policies, scholarship and loan programs, and athletic and other school-administered programs.